Your creative juices may flow more easily if you have a clean canvas to work on. This means that it’s time to work up a sweat by scrubbing and shining up your humble garage door. Just be sure that you’re using the correct cleaning products according to what your door is made of. For example, if you have a steel or aluminum door, you might need something different than if you have a glass or milk glass door. You may also need to get an additional product if you have a sectional door with glass panels. 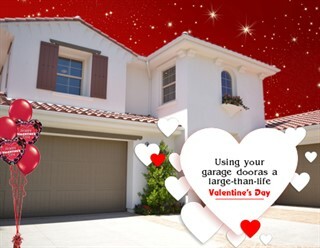 Painting your garage door just for Valentine’s Day may sound a bit extreme, but it won’t be just for that one day. You’ll have a beautiful door all year around. Just be sure to choose a neutral color in case you want to decorate it for Halloween or Christmas. If you’ve found the perfect card for your loved one but want to make this Valentine’s Day extra special and romantic, why not decorate your garage door to look like the card? It may sound complicated, but it really doesn’t need to be. You could easily get some large-scale decals that you can put up and take off easily. We strongly advise against using paint to create your masterpiece as you may just be stuck with a beautiful door, that's filled with hearts, come Thanksgiving! The exterior could be filled with pictures, and the interior could have a special and private message for the one you love. We wouldn’t want the whole neighborhood reading your personalized love letter sprawled across the exterior of your door! Going all out with decals and life-sized prints is great, if you can afford it. However, if your wallet is still recovering from the festive season, there are more affordable options. These include using simple fridge magnets, which will work best against steel doors. You also can’t go wrong with heart-shaped LED lights or pretty fairy lights. It’s easy to get caught up in the excitement of decorating but you need to make sure that you’re being safe. This is especially the case when it comes to overhead garage doors. If you are making use of fairy lights, make sure that the wires aren’t anywhere near the cabling of your garage door, or that there aren’t any obstructions hindering its movement. Valentine’s Day should be a day for relaxing with your loved one, not for stressing out!